Introducing a permanent solution that actually repairs your digestion, so you can put an end to heartburn, gas, indigestion, acid stomach, constipation, and other misery. Starts working the very first day! If you’re reading this right now, chances are you’ve tried everything to solve your chronic digestive problems. Perhaps you’ve used probiotics, enzymes, and other natural therapies. Maybe you’ve even resorted to antacids, laxatives, and some of the other usual treatments. Yet you may still suffer from digestive nightmares like heartburn, acid reflux, indigestion, gas, bloating, constipation, or diarrhea. That’s true even if you steer clear of “problem” foods you used to enjoy, like dairy products, spicy dishes, and pizza. My name is Dr. Janet Zand. I treat many patients with chronic digestive issues. Some of my patients tell me that no matter what they do, they still can’t splurge and eat a cheeseburger or ice cream without paying the price later. They burp constantly, feel gassy, and are too bloated to fit into their clothes. And no matter what they do they are still constipated. To help my patients with digestive issues, I turn to an ancient Chinese remedy that’s been used to successfully treat stomach and bowel problems for thousands of years. It works amazingly well since it corrects an underlying condition that’s causing this misery in the first place. Most people have no idea they have this common yet often overlooked condition. But now when patients come to me with digestive problems, I usually find they show signs of it. There are many telltale symptoms. Sometimes my patients are overweight or low on energy. They may get a heavy feeling in their stomachs after eating, and their stools are loose or sticky. Or they often feel cold and may even notice numbness in their fingers and feet. But once they begin using this ancient Chinese remedy to reverse this condition, they’re amazed at the change. They can get back to eating the food they like without problems…just like when they were years younger. They also feel lighter and more energized. Best of all, their miserable stomach and bowel problems STOP coming back! Let me explain what this ancient Chinese gut-healing secret is, and how it can work wonders for you, too. Perhaps you’re familiar with Chinese acupuncture. Acupuncture is based on the idea that all illness is due to an imbalance or blockage of “qi”(pronounced “chee”). Qi is the natural energy that flows through the body. This vital energy flows through a system of channels called meridians and regulates all your body’s functions. When you get sick or your body doesn’t function like it should, it’s often due to some external cause invading your body via the meridians. This external cause creates a disharmony in your body. It spreads to your organs and systems through the different channels. It also creates an obstruction that interferes with your body’s qi, or flow of energy. So the effected bodily function doesn’t work properly. It can even shut down. What does this have to do with digestion? Everything! Maybe you used to be able to eat whatever you wanted when you were younger. But now you often suffer from indigestion, gas, bloating, constipation, and other problems. This means there’s a disharmony in your body that’s obstructing your energy flow. By obstructing your energy flow, it’s making your digestive system shut down and triggering your miserable stomach and bowel problems. Why is there this disharmony in your body? Because your digestive system is burned out. That’s right— just as stress and other factors can leave you feeling exhausted and burned out, your digestive system can also get tired and burned out. And it’s often the result of our hurried, modern lifestyles. Rushed eating, late meals, large portion sizes, not enough sleep, too much stimulation and stress… ALL of these factors can burn out your digestive system and overwork it to the point of exhaustion. Some medications, like antibiotics, also burn out your digestion by killing off friendly bacteria. And eating foods high in sugar and white flour give bad bacteria added fuel so they can thrive in your gut, making your digestion even worse. This type of digestive burnout leads to a common underlying condition known in Chinese medicine as “cold” digestion. While doctors who practice Traditional Chinese Medicine have successfully treated this condition for thousands of years, most Western doctors have never heard of it. When your digestive system is cold, it can lead to stomach upset, gas, abdominal pain, constipation, diarrhea, and other problems. But these problems don’t happen because your internal body temperature is cold. This has nothing to do with it. Cold digestion has to do with the chemical reactions that take place inside your body to promote healthy digestion. These reactions can be temperature-sensitive. To understand how this affects your digestion, think about the basic physics of water. When you put water on the stove, it moves faster and comes to a boil. There’s more activity. When you put water in the freezer, it slows down and freezes. There’s less activity. As you can see, heat increases activity. Cold decreases activity. The same is true with your digestion. Smooth, problem-free digestion relies on a series of chemical reactions between acids and enzymes produced in your digestive tract. As I said before, these chemical reactions are temperature-sensitive. Heat increases digestive activity, while cold decreases digestive activity. When your digestive system is too cold, even the most basic digestive functions become impaired. You can’t produce enough stomach acid and enzymes to break down food, since these chemical reactions require a warm digestive environment. As a result, your body is no longer able to process food and fluids properly. This broken mechanism triggers a chain reaction of unfortunate events in your digestive system. Without enough stomach acid and enzymes, your food isn’t broken down well. So you don’t absorb all of the nutrients it contains. Your organs don’t get the nutrients and energy they need. So your stomach, intestines, liver, and kidneys become fatigued and can’t do their jobs. Food is no longer broken down in your stomach and small intestine. Instead, it just sits in your gut and rots, turning into a toxic, festering mess. And because you’re not properly processing the foods and fluids you take in, you suffer from constipation or you’re running to the bathroom with diarrhea. Pretty miserable, right? All because your digestive system is too cold and burned out to function the way nature intended. Now take a look at what happens when your digestive system is “warm.” It starts to work as soon as you smell food and envision your first bite! That’s when your brain sends signals to your digestive system telling it to get ready. The moment food enters your mouth, the enzymes in your saliva go to work. These enzymes immediately begin breaking down any sugars and starches into glucose. This glucose goes directly into your bloodstream, so your body can use it to produce energy. Other enzymes spring into action as soon as any protein you eat hits your stomach. As the food moves through your stomach into your small intestine, these enzymes convert protein molecules into amino acids, which are then used by your body to build and repair tissue. Any fat you’ve consumed is broken down into fatty acids and cholesterol using bile acid from your liver. And your intestinal walls easily push out impacted waste and eliminate it. In other words, there’s NO heartburn, NO indigestion, NO gas, NO acid reflux, and NO constipation or diarrhea. When your digestive system is warm enough, it’s nothing but smooth sailing! Fortunately, it’s easy to reverse digestive burnout and the cold digestion that comes with it. Traditional Chinese Medicine relies on a wide variety of natural herbs and spices to warm up your digestion. In fact, you’ve likely used some of them before in home remedies. For example, your mother might have told you to drink ginger ale whenever you had an upset stomach. Mom was onto something…ginger root has long been used to fight nausea, gas, and indigestion in traditional Chinese medicine. That’s because ginger root warms the energy channels throughout your body and relieves dampness and chill. Another popular digestive remedy you may have heard of is black pepper, which helps combat “acid” stomach. Known as Piper nigrum or piperine in traditional Chinese medicine, black pepper helps boost production of digestive enzymes. But there are many other herbs used in Chinese as well as Ayurvedic (Indian) medicine that help warm and strengthen your digestive system. Some of these herbs are rare and hard to find. For example, sacred lotus extract has been used in Asia for thousands of years, primarily for abdominal cramps, loose stools, and other digestive issues. And lesser galangal root helps stimulate the release of gastric juices to aid digestion. There are at least 21 herbs, spices and other nutrients that work together to provide a fast, lasting solution for your miserable digestive problems. But you’d be hard pressed to pull all of them together yourself in the right combination and potencies. That’s why I want you to know about a remarkable digestive remedy that has all of these time-proven ingredients in one convenient formula, in their highest quality forms. What is this digestive remedy? It’s called Integrative Digestive Formula™, and it’s the best solution I’ve seen for chronic digestive problems. What makes it so effective is it warms, strengthens, and repairs your digestive system so it can work better naturally. Integrative Digestive Formula contains a wide range of ancient Chinese and Ayurvedic herbs and spices that warm up your digestion. This digestive “heat” stimulates the production of vital enzymes and other substances. Integrative Digestive Formula provides more “heat” to your digestive system by moving energy downward through your digestive tract. Moving digestive energy downward helps stimulate the production of enzymes and stomach acids. This gives you more stomach acid to break down the foods you eat. It provides more enzymes to metabolize fats, proteins, and carbohydrates. And it helps you better absorb and utilize nutrients. Some of these spices can keep bad bacteria at bay while leaving the good bacteria alone. Others can reduce colonies of bacteria that cause food poisoning. And others help you increase production of digestive enzymes, which falls off with age. When these herbs and spices are combined, their effects often multiply. So you get the combined benefit of the antioxidants and other plant compounds found in these herbs and spices—making them much more powerful when taken together than apart. I already mentioned that ginger root has long been used to fight nausea and indigestion in Traditional Chinese medicine. It also protects your digestive tract and liver from toxins and parasites. In fact, one study sponsored by the National Institutes of Health found ginger inhibits the growth of the bacteria H. pylori. I also told you how black pepper, which helps combat “acid” stomach, helps boost production of digestive enzymes. But it may also protect you from food poisoning. One study found black pepper contains compounds that kill off 25% of the bad bacteria found in food that causes spoilage. Then there’s cassia bark, more commonly known as Chinese cinnamon. This spice is used in Traditional Chinese medicine to help warm the kidneys and spleen, which can prevent gas and halt diarrhea. Research shows cassia bark also acts as a potent inhibitor of intestinal bacteria. That’s why it’s also effective for relieving stomach cramps and nausea. Lesser galangal root helps relieve gas, bloating, sluggish digestion, and constipation. It’s also useful for treating occasional nausea. Tangerine peel (also known as Citrus reticulate) provides wetness to digestion and decreases phlegm, which builds up as a result of not processing fluids properly. These actions can be particularly helpful in fending off acid reflux. Henon bamboo (also known as Phyllostachys nigra) promotes free radical scavenging activity. One published study found it stimulated antioxidant activity while also preventing LDL cholesterol oxidation. All these herbs and spices work together to keep food from stagnating in your stomach and digestive tract. As a result, you get a warmer, more energized environment where acid reflux, heartburn, indigestion, constipation, bloating, and gas are simply not possible! The funny thing is, you don’t feel warm or sweaty when you take this formula, nor do you notice any unpleasant side effects. It’s so safe, you can take it with any other supplements or conventional treatments you’re using now. In fact, it will help you use and absorb your supplements more efficiently. 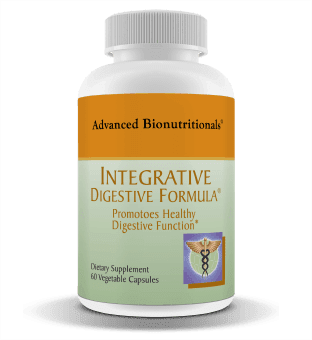 Integrative Digestive Formula has another important and unique action. It actually strengthens your entire digestive system. This is important because one reason your digestion gets cold is that your system has weakened due to digestive burn-out. If you often suffer from heartburn, gas, bloating, constipation, and other stomach and bowel problems, you probably have a weak digestive system. Another sign of a weak digestive system is if you often get that burning feeling in your abdomen after eating a big meal. This may mean your sphincter muscle at the top of your stomach has weakened to the point that it no longer closes properly. As a result, undigested food flows back into your esophagus and causes that agonizing sensation that keeps you up at night. And if you often feel tired after meals, get cold easily, or have noticed declining memory or “brain fog,” you may also suffer from a weak digestive system. Because your digestive system is weak, you’re probably not absorbing nutrients properly. So what causes your digestive system to weaken in the first place? For one, every time you eat a large meal, you stretch and weaken the walls of your stomach. As a result, food stays in your stomach longer than it should, and becomes a breeding ground for bad bacteria. What’s more, your digestion is constantly bombarded by pollution, chemicals, heavy metals, and other unavoidable stresses that make it weaker. When your digestion is weak, these dangerous toxins can sneak past your intestinal walls and get into your bloodstream. From there they attack your organs and tissues and trigger inflammation. A strong, healthy digestive system creates a healthy barrier and protects you from these threats. But that’s not all. You need a strong stomach and intestinal walls to help push food and waste downward through the 30-foot trek of your digestive tract. And you need a strong, well-supported liver to produce plenty of bile to break down fats and whisk away toxins. You can’t exercise your digestive system to make it stronger, like you can a weak elbow or knee. But you can strengthen it by taking certain herbs that you get in Integrative Digestive Formula. Some of these herbs have been used in Ayurvedic medicine to treat digestive disorders for thousands of years. Chances are you already know about the potent antioxidant powers of the pomegranate fruit. It’s one reason why pomegranate seed (also known as Punica granatum) helps build a strong barrier in your gut against toxins and other threats. But pomegranate seed also has the ability to strengthen digestive activity in your stomach, small intestine, and colon. Plus it tones the pancreas and regulates intestinal movement. You’ve also probably heard of cardamom, a popular spice used in Indian cooking. But cardamom fruit (or Amomum kravanh) can also fortify your digestive system. This herb strengthens bile flow and gastric secretions, while promoting kidney function and warming the stomach. Studies show cardamom has a potent gastroprotective effect against bad bacteria, toxins, and certain aspirin-induced side effects. Sacred lotus (also known as Nelumbo nucifera) keeps food moving through your digestive tract and enhances nutrient absorption. Research shows this medicinal plant contains several bioactive compounds, whose benefits may include enhanced liver and digestive function. Deglycrrhizinated licorice (DGL) has a long history of use for treating certain stomach disorders. It’s even listed on the German E Commission Monograph as an approved treatment. In one human study, three-quarters of people who used DGL were 50-75% better after the first day, and 100% healed by the third day. The stronger and healthier you can make your gut, the better it can create an impenetrable barrier and protect you. That’s why Integrative Digestive Formula boosts your immune power with a potent complex of medicinal mushrooms. This certified organic blend not only gives your immune system powerful support, but also repairs your digestion in the upper digestive tract and enhances liver function. These immune boosting mushrooms—Hericium, Maitake, and Poria—contain high doses of beta glucan, a substance that activates your body’s own Natural Killer immune cells. Within hours of when you take this formula, these disease-fighting immune cells go on “high alert” throughout your digestive system and entire body. Once activated, they begin a search-and destroy mission—killing off toxins, viruses, and harmful bacteria. They also explode abnormal cells before they can multiply and lead to serious problems. But these potent medicinal mushrooms do more than supercharge your immune system. They also help repair what’s wrecking your digestion. For example, Hericium also supports your liver to aid with detoxification. Poria is prized for its ability to enhance healthy digestion in the upper digestive tract. And Maitake is so powerful, research shows it can even fend off the harmful effects of chemotherapy. It also promotes healthy blood sugar and cholesterol levels. Many older adults are deficient in two crucial minerals your body needs to digest food. What are they? Zinc and chromium. You probably know you need zinc to boost immune health. But it’s also required for producing crucial enzymes in your body. These enzymes are used to break down carbohydrates and allow your body to absorb nutrients. Meanwhile, chromium helps alleviate sugar cravings. What does this have to do with digestion? Plenty. You see, sugar and other refined carbohydrates fuel the proliferation of “bad” bacteria and fungi throughout your digestive tract. This not only causes stomach upset, it can lead to inflammatory bowel disease. What’s more, an overgrowth of bad bacteria can lead to candida albicans, a condition associated with chronic fatigue syndrome, depression, memory loss, and other debilitating health issues. By restoring optimum levels of zinc and chromium with Integrative Digestive Formula, you’ll enjoy enhanced digestion and better bacterial balance. But you may also notice a wonderful “side effect” of stronger digestion: easier weight loss! As I explained earlier, digestive enzymes play a vital role in breaking down your food so it can be easily absorbed. The more you have, the more easily you can digest food. Unfortunately, as you get older you produce fewer enzymes. And you’re not getting them from any cooked or processed food you eat. That’s why Integrative Digestive Formula also includes a blend of digestive enzymes with guaranteed potencies. What’s on the label is what you get. This means you can count on them to help correct any enzyme deficiency you may have. You get a variety of enzymes to cover all your bases. They’ll help you better digest fats, protein, carbohydrates, and much more. And because they’re naturally derived and free of fillers, they work hand-in-hand with the enzymes produced by your stomach to make your digestion better. Not only do these enzymes support smooth digestion, they help you absorb more nutrients from the food you eat. That means you get morebenefits from any supplements and medicines you take. Unlike “band aid” solutions like antacids or acid blockers, Integrative Digestive Formula isn’t a quick fix. This powerful, scientifically formulated blend of herbs and nutrients works with your body over time to repair and strengthen your digestive system—not just banish your symptoms. But that doesn’t mean you won’t experience dramatic results quickly. In fact, the vast majority of people notice a dramatic difference in their digestion within the first 30 days or less. In fact, many people notice much less gas, bloating, and indigestion almost immediately. Other problems that are more serious or chronic—like constipation or acid reflux—may take a few weeks or more before you see a dramatic difference. The reason Integrative Digestive Formula works so well is because it finally solves the underlying cause of your digestive misery. Thanks to this powerful formula’s five unique actions, your results last—and get better over time. When your digestion is strong, you won’t be brought to your knees by agonizing heartburn, acid reflux that keeps you up all night, or bathroom problems that make it difficult to leave home…. When you replenish missing enzymes, you won’t suffer unknowingly from a nutrient deficiency, and get the maximum health benefits of the food and supplements you take in. Imagine how great it will be to eat anything you like again…without it bothering you. You can get back to enjoying life to the fullest, without putting up with searing heartburn, sleep-depriving acid reflux, embarrassing belching or gas, or tortuous indigestion, constipation or diarrhea. What’s more, you’ll be able to say “good-bye” to band-aid solutions that often bring with them unwanted side effects…plus cost you a fortune. In fact, I’m convinced Integrative Digestive Formula is the last digestive solution you’ll ever need! Nothing else I’ve seen works better for making your digestion stronger and healthier naturally. That’s because Integrative Digestive Formulagets to the root cause of your digestive problems and fixes them at the source. By giving your body what it needs, the food you eat moves through your stomach and entire digestive tract smoothly and efficiently, without making you pay the price later. I know this powerful solution can work for you. I’ve seen it change my patients’ lives for the better. And I’ve even seen it solve my own digestive problems! …Diane Q. of New Jersey says that after taking Integrative Digestive Formula for just 2 weeks, she put an end to the constipation and occasional bloating she’d suffered from for over a decade. She no longer needs to take laxatives to stay regular, and the bloating is gone, too. …Jack N. of Colorado says that within 2 weeks of taking Integrative Digestive Formula, acid reflux became a thing of the past. He now sleeps through the night, and is back to eating all the spicy foods he wants, even chilies! …Carol W. of California says that since she started taking Integrative Digestive Formula, the churning feeling in her gut has gone away—and the “insane” heartburn she used to get is also gone. No more gassiness in her gut, either! …Phyllis J. of Texas says she could feel Integrative Digestive Formula working from the very first time she took it. She felt this soothing warmth in her stomach from the start and since then, she no longer suffers from gas and diarrhea. You’ve probably tried other digestive remedies that didn’t pan out. Or maybe they were simply “band-aid” solutions, with undesirable long-term risks and side effects. Put Integrative Digestive Formula to the test for as long as you like. If you’re not 100% convinced this supplement has made a dramatic difference in your digestive health—and that it’s the last solution you’ll ever need—you can return it at any time… even if the bottles are empty. We’ll refund every cent, including shipping and handling charges. No hassles, no questions asked. You truly risk nothing in giving Integrative Digestive Formula a try. Since you risk absolutely nothing, why not click here to order some today? Why spend another day letting your digestion get worse — and your overall health along with it? You can get a month’s supply of Integrative Digestive Formula™ for only $39.95. That’s a full month of heightened immunity and digestive support for less than the cost of a nice dinner out! Once you see how much better you feel and how much easier it is to digest the foods you love, you won’t want to miss a single day. And you’ll want to keep taking it to fully heal your digestive system. FREE Gift #1: What You Need to Know About Supplements BEFORE You Buy (a $9.95 value). You’ve probably read about almost every nutritional option out there … but you may not know which ones can help and which ones can hurt. Get the real story on what to buy, what to avoid, and what really works. Without wasting your money or risking your health. How to take fewer supplements and feel even better. Why mega-dosing isn’t always best. Why popular one-a-day vitamin formulas are a waste of your money. And what to take instead. How to select high-quality nutritional supplements. Once you know these tricks, you’ll never be taken again. The juice you should never drink when taking zinc to fight a cold. Cancels out the zinc! The truth about coral calcium. Is it really healthier and more absorbable than other kinds? Here’s the answer based on scientific research. The right way to take CoQ10. If you leave this important step out, you’re not getting all the nutrients you need. I’ll be happy to send this report to you as soon as possible. It’s your FREE with the Buy-3-Get-1-Free Savings Pack. That’s a combined value of $169.75 for only $107.85 — a total savings of $61.90! Follow this link to place your order right now! FREE Gift #2: A handy digital pedometer (a $9.95 value). As you free yourself of digestive worries, you’ll get back the freedom and energy to do what you want. You’ll become more active. A terrific way to measure your success and keep yourself motivated is with a pedometer. You can use it to keep track of all the miles you walk in a normal day. Then watch that number climb as you get outside and exercise! It’s yours free when you get the Buy-6-Get-2-FREE Savings Pack. That’s a combined value of $339.50 for only $199.50 — a total savings of $140.00. The shipping’s on me if you respond right away. Integrative Digestive Formula™ is not available in stores. There’s no other way to get it unless you order it by mail. And that means incurring shipping and handling charges. But I’ve arranged for you to receive FREE shipping and handling when you request Integrative Digestive Formula™ right away. That’s right! You won’t pay a single penny. Why have I done this? Because I want you to get this powerful formula into your hands as soon as possible — so it can start improving your digestive health right away. Consider it my friendly little nudge to get you to act now. So why not do it now, while it’s still fresh in your mind? After all, you’re fully protected by my down-to-the-last-pill guarantee. If you are not satisfied, for any reason, you can return it for a full and complete refund of your purchase price. Even if you are down to your last tablet. There’s no reason to spend another day living with your digestive problems (as in “you’ll just have to live with them”). Not when you can try Integrative Digestive Formula risk-free. You have nothing to lose — except the pain and suffering you endure now. And ordering couldn’t be easier. Just click here or call 1-800-791-3395 and they’ll rush your supply of Integrative Digestive Formula to you right away. The friendly health consultants are available 24 hours a day, 7 days a week. P.S. Modern life constantly beats on your digestive system. Stress, medications, pollution, eating on the run…all weaken your digestion so it can’t do its job. It’s no wonder why over half of us suffer from digestion troubles. But you don’t have to be one of them anymore. Try Integrative Digestive Formula™ risk-free. Click here right now or call 1-800-791-3395 today for your rushed shipment.